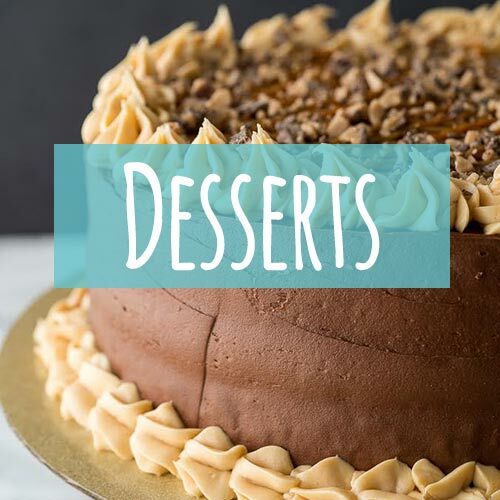 With Easter Sunday just around the corner, I figured it would be the best time to share some of our favorite side dish recipes that go perfectly with an Easter Ham! 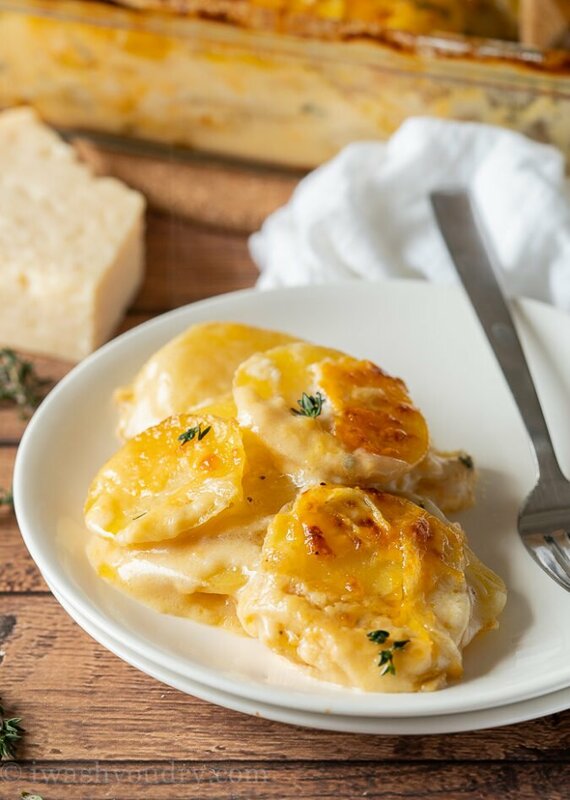 Layers of thinly sliced potatoes, cheese and a creamy sauce filled with garlic and thyme are baked until bubbly and then broiled for a nice crispy top. Start by thinly slicing your potatoes. I love to use my Mandoline Slicer for an even slice, plus it takes a fraction of the time slicing by hand takes. Melt some butter in a skillet and sauté the onions and garlic until tender and fragrant. Whisk in some flour to form a roux, then whisk in milk and chicken broth. Season with fresh thyme, salt and pepper. It seems that over the years, the Scalloped Potato and Au Gratin Potato dish have become almost identical in nature with just a few slight variances. 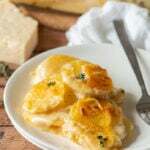 Scalloped Potatoes is a thinly sliced potato, primarily cooked in a cream sauce, sometimes contains cheese and is always topped with a bread crumb topping. Au Gratin Potatoes is a thinly sliced potato, sometimes cooked in a cream sauce, always contains cheese and sometimes has a bread crumb topping. Since my recipe contains thinly sliced potatoes, a cream sauce (made lighter by using milk instead of cream), cheese (hello!) but does not have a bread crumb topping, I’m declaring this recipe to be Scalloped in nature. At the end of baking, we will remove the foil and broil the potatoes, giving it that crisp topping that you’ll typically find in a scalloped dish. 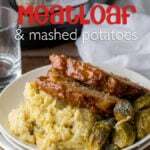 What Type of Potato for Scalloped Potatoes? You could easily use a baking potato for this recipe, but my all time favorite are the Yukon Golds. The skins on the Yukon Gold potatoes are so thin, that there is no need for peeling, meaning we can skip that arduous task and go right to slicing. Gold potatoes also have a creamy, soft texture to them, making them perfect for baking in the cream mixture. Can I Slice Potatoes The Day Before? – You can definitely slice the potatoes a day ahead of time, but you’ll want to place the sliced potatoes in a bag or container and cover with cold water to prevent too much browning. I would only do this up to the day before. Can I Make This Recipe Ahead of Time? – YES! 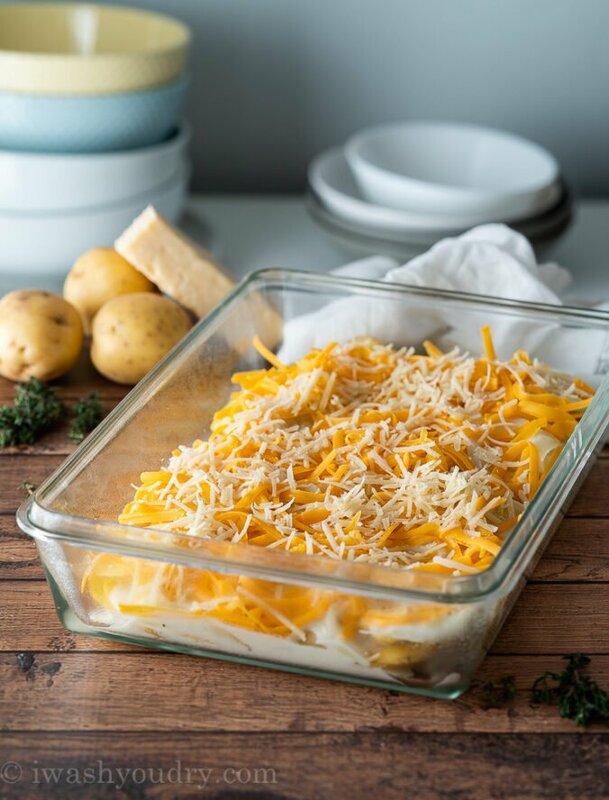 Simply bake the Scalloped Potatoes as directed in the recipe below, let cool completely, cover with foil and refrigerate up to 3 days. How Long Does It Take To Reheat Scalloped Potatoes? To reheat, place in a 350 degree F oven, covered, for 30 minutes or until heated through. Can I Use Different Cheeses? You betcha! I love the flavor of sharp cheddar and parmesan cheese, but you can use flavorful, melty cheeses like mozzarella, gouda, fontina or gruyere. Can I Use Different Seasonings? Of course! I love the fresh flavor of thyme, but a parsley, cilantro or even rosemary would work great in these potatoes. If you’re not into the green herbs, feel free to leave it out! 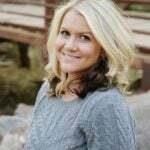 Can I Freeze Scalloped Potatoes? Unfortunately, no. I do not think this recipe would work well being frozen. The cream sauce and potatoes would not have the best texture once baked after frozen. 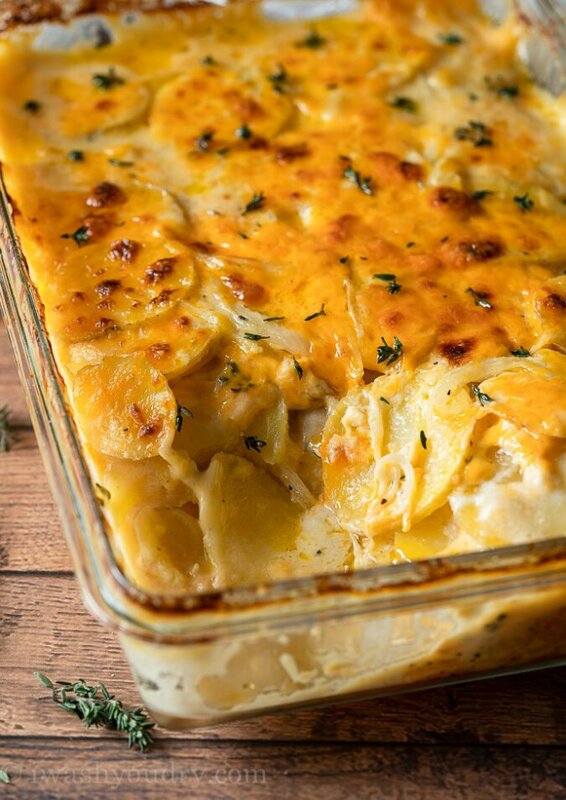 This is the BEST Scalloped Potatoes recipe! 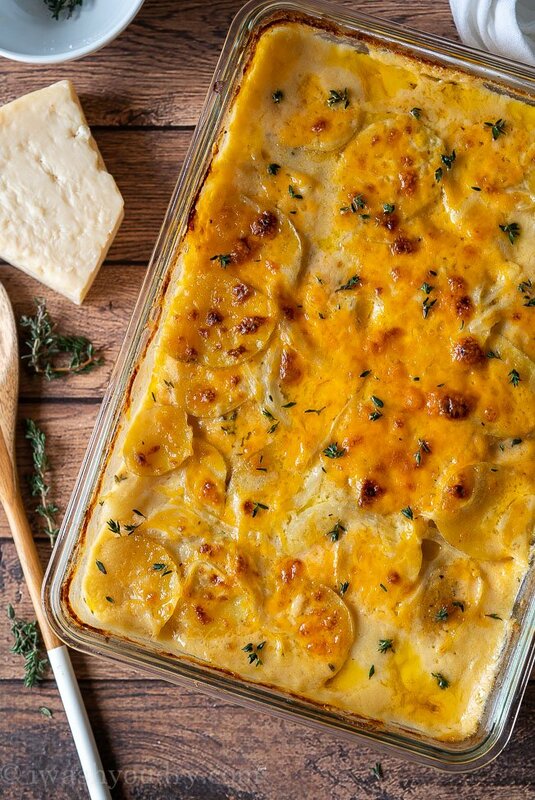 Super creamy, tender potatoes, cheesy layers and topping! 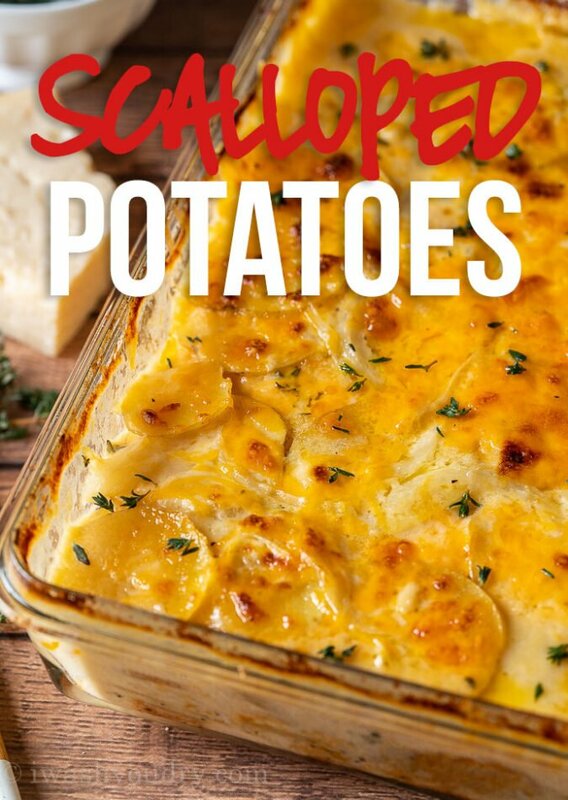 You really can’t go wrong with these cheesy potatoes! 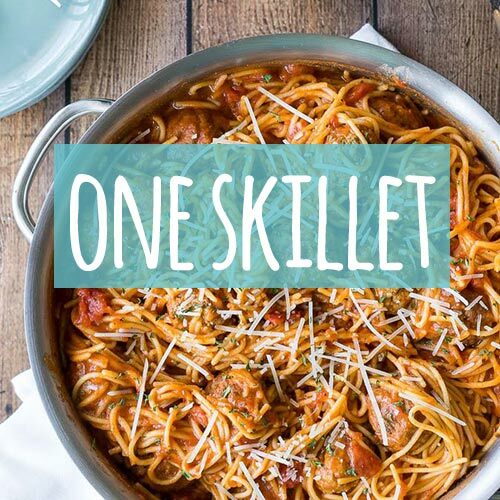 Serve them with any of these delicious main dishes for a comfort meal that’ll blow you away. 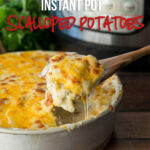 Instant Pot Scalloped Potatoes – cheesy goodness that’s ready in a flash! How To Bake the PERFECT Potato – crispy skins and fluffy insides! 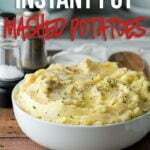 Instant Pot Mashed Potatoes – creamy goodness that’s ready in minutes! Parmesan Roasted Potatoes – crispy outsides and creamy insides, with a parmesan coating! 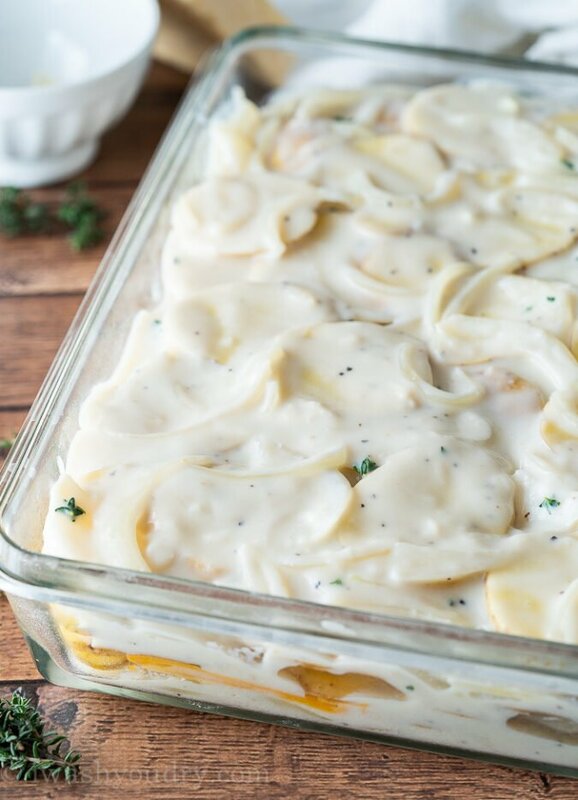 I know you’re going to love this Cheesy Scalloped Potatoes Recipe! Amazing! Family loved them… and all the potatoes were cooked perfectly- which is sometimes hard to achieve with other recipes. I would recommend letting sit for slightly longer then 5 minutes- I found closer to 10 minutes was perfect to properly set them (and still remain quite hot). Will make again! I’m so glad your family enjoyed them! I will have to try these potatoes!! I highly recommend it. Enjoy!